Police have arrested a boy accused of using a North Carolina man's photo and name on social media to threaten a Maryland school with a shooting spree. A 14-year-old boy has been charged with making a threat of mass violence, Pringe George's County police said. Police say the boy had no means to carry out the threat, which spread fear and sent Crossland High School into lockdown on Tuesday. "I'm going on a shooting spree soon at Crossland High School in Temple Hills," the threatening tweet read. The Prince George’s County police and official school twitter handles were tagged in the post. Another tweet showed two photos of several guns. The school was placed in a modified lockdown: No one was allowed to enter the school, but parents could come pick up their children. Several did. "I just want to make sure that they’re safe," one parent said. "It’s hard for me to focus at work, it will be just as hard for them to focus at school." "Considering what just happened in Florida, you still believe it can happen at home," Garry Herrod said before picking his son up from school early. "I was a little scared. I was uncomfortable," Herrod’s son said. County Police Chief Henry Stawinski posted a response on Twitter, saying the search for a suspect is narrowing, and urged the person who posted the threat to turn themself in. "We have narrowed our search for this individual down to a specific place, and I have detectives at that place right now," he said. The school promised to expel the person who posted the threat if they are a student. 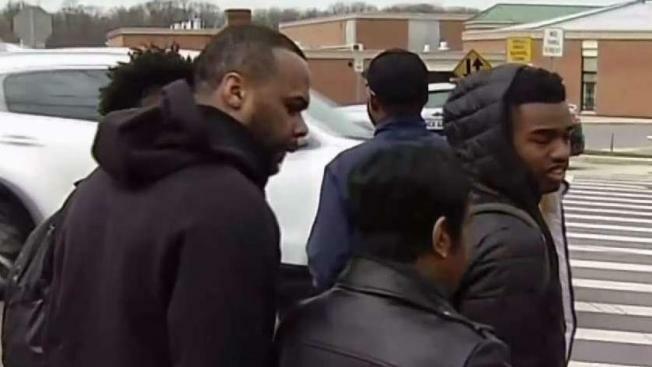 It's unclear if the boy attended Crossland High School or if he surrendered to police. The boy created a Twitter account using the name and photo of a 23-year-old North Carolina man. The man’s mother told News4 that her son was not involved in the threat. This threat is one of many that schools in the D.C. area have confronted since the Feb. 14 shooting at a Parkland, Florida high school where a former student killed 17 people. An 18-year-old man turned himself in Monday after police accused him of posting a threat against Fairfax High School in Virginia. Two teenage boys turned themselves in and were charged in connection with a threat toward Walt Whitman Middle School in Alexandria, Virginia. Investigators say the boys were trying to impress a girl. A University of Maryland student, Ryan Matthew Sulkowski, was arrested and banned from campus for allegedly threatening to shoot campus police. Alwin Chen, a student at Clarksburg High School in Maryland, was arrested on accusations that he brought a loaded gun to school. Schools and police departments across the country have dealt with hundreds of threats since the Parkland shooting. Educator's School Safety Network, which tracks reports of school threats and violent incidents across the country, counted 797 incidents since the Parkland shooting. Nearly half of those threats were made over social media.